Northwest University students had the opportunity to engage in meaningful conversation about a number of topics regarding women’s leadership, empowerment and feminism during March’s Courageous Conversations. Hosted by NU’s Multicultural Life and facilitated by director of multicultural life, Dr. Nina Hanson, the event covered topics ranging from intersectionality, the gender wage gap, glass ceiling, and gender bias. Panelists included students Farangis Begalieva and Jane Cooksley, ministry assistant at Campus Ministries, Megan Netherton, graduate program professor of psychology, Dr. Nikki Johnson, and biology professor, Dr. Tracie Delgado. 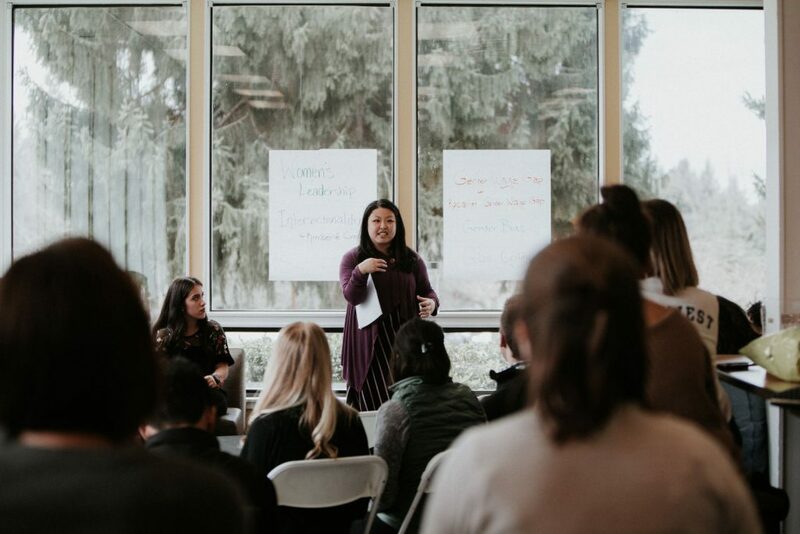 The open and informal format of the Courageous Conversations series encouraged personal and diverse perspectives on the subject of women in leadership. Johnson presented statistics showing the difference between the acts of men and women, inspiring women to be bolder in how they handle themselves, while Hanson said that women should do their jobs unapologetically and uphold a certain level of caliber within the workforce. Student Katrina Bowen said she appreciated the comfortable environment to discuss a challenging topic. “It’s been a journey of realizing the rich history that is behind me being able to attend a university as a woman, so I want to be engage myself in that conversation – especially when its facilitated so well by Dr. Nina where it’s still a safe environment but still raw,” Bowen said. Student Brian Chen, who is from China, said that the event was interesting for him to see the comparison to the way different countries handle the issue of women’s empowerment and feminism. “I’m interested in women’s leadership and how they navigate that world through different personalities. People in America have lots of freedom compared to China, so to see this is pretty cool,” Chen said.